4.5 superb	by Tyler Fisher STAFF Sputnik Reviews 2007-08-21 | Edited for this posting. When you play guitar with Jerry Goodman on an album that draws from the same style as Mahavishnu, people are bound to compare you with John McLaughlin. Technically, Boullt plays just as well, if not better, than Mahavishnu's innovative guitarist. His fast, jazzy soloing style could fit right inside Birds of Fire. However, Boullt makes sure he is no McLaughlin clone. He often uses simple melodies instead of technical playing all of the time, which therefore makes the faster sections stand out more. 2007-08-21 | Edited for this posting. When you play guitar with Jerry Goodman on an album that draws from the same style as Mahavishnu, people are bound to compare you with John McLaughlin. Technically, Boullt plays just as well, if not better, than Mahavishnu's innovative guitarist. His fast, jazzy soloing style could fit right inside Birds of Fire. However, Boullt makes sure he is no McLaughlin clone. He often uses simple melodies instead of technical playing all of the time, which therefore makes the faster sections stand out more. Either because of personal taste or just an evolution of the times, Boullt uses tapping techniques and harmonics, ideas shown more in metal music, much more than his predecessors and it draws comparisons to other guitar virtuosos like Steve Vai or Joe Satriani. In fact, the bass player and drummer from Vai's backing band, Stu Hamm and Jeremy Colson join on the album for two songs, ?Bravo Davo de la Torre? and ?Groovin' with Stu.? The former provides variety to the jazz fusion style of the album, bringing out the metal subtleties in a full-fledged instrumental metal song. It features a simple, repetitive rhythmic riff and a strong drum beat laced with double bass while Boullt solos on top with some of his fastest playing on the album. These other influences, exemplified on ?Bravo Davo de la Torre?, make Composition different from the inevitable Mahavishnu comparison. While ?Bravo Davo?? is a typical virtuoso composition, designed to show off Boullt's guitar talent, he titled the album Composition for a reason. For the most part, the songs on the album find Boullt the primary member, but in the way that a vocalist is the standout member of a typical rock outfit; he carries the melodies. ?Chasing the Whirling Dervish? begins showing off some acoustic guitar work as a feature. On most of the album, Boullt double tracks himself with one acoustic guitar riff helping with chordal structure while he plays his melodies and solos on electric. As the song progresses, violin and guitar add melodies until it finally bursts into a frenetic guitar solo from Boullt. The progression and composition of the song itself shows that Boullt knows how to compose just as well as he plays guitar. Of course, it helps that his backing musicians other than Goodman are extremely talented. Atma Anur plays brilliantly on the drums, switching styles on the fly and bridging the different styles represented on each song perfectly. Sukhawat Ali Khan provides vocals on ?Call for Peace?, which adds a whole new dimension to the song. His voice provides a whole new realm of power to the already powerful instrumental music. Each musician who performs on Composition does a brilliant job, playing up to Boullt's standards while pushing him further and further. 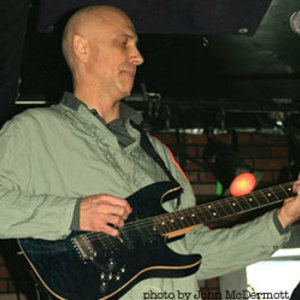 Composition combines the jazz fusion and rhythmic complexity of 70's artists like Mahavishnu Orchestra with the hard rock/metal styles of other guitar solo artists like Joe Satriani. Boullt's compositional skills, however, make him stand out from his contemporaries. From the Eastern styles of ?Cleopatra's Third Eye? to the rock-infused complexity of ?Page Revisited,? he bridges many different styles together with musicianship that many cannot fathom. Still, he falls into the typical trappings of this styled album. The confidence exuded by all of these musicians makes for a lack of climaxes. Most of the album comes across at the same volume. Faster guitar does not necessarily mean it feels like a climax. Regardless, Composition is an album to be admired, as it pushes forward in modern music while still throwing homage back to Boullt's influences and idols. This is a cathartic, intense album- anything but easy.